And I guess that explains why the League of Assassins are present in the story... nice. That spoilery cover is just glorious! To quote Terry Perry Stockman, "This is gonna be good!" We Statue of Liberty now. 32 pages, $3.99, in stores on April 18. I guess this is the cover for #6? Nice cover! Guess this means Donatello might be in a more normal state for the final issue? It seems strange that all the villains are missing though... maybe they will appear on a Cover B or even a wrap-around cover? I'll confess I'd probably rather see a big battle in Gotham City's "Statue of Justice." 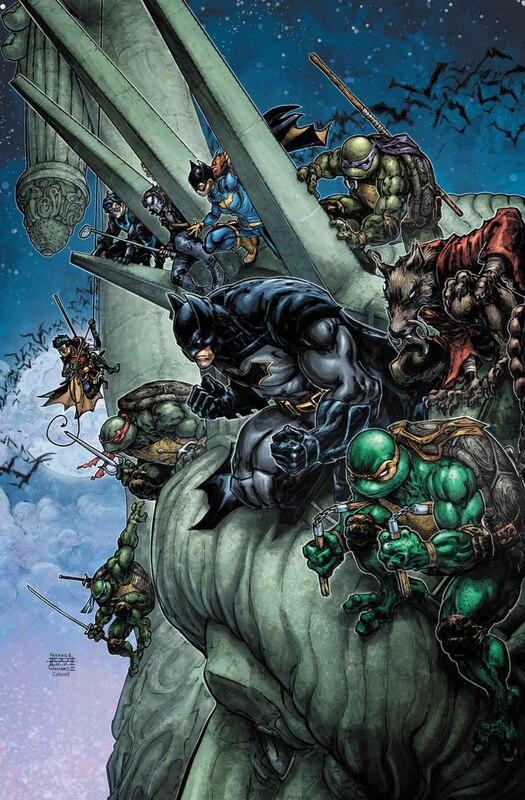 Yes, this is the cover for Batman/TMNT#6. Anybody know if there will be a surprise 7th issue? They through in a surprise issue for the Batman Animated crossover, so wouldn't be too surprised if they follow suit here.